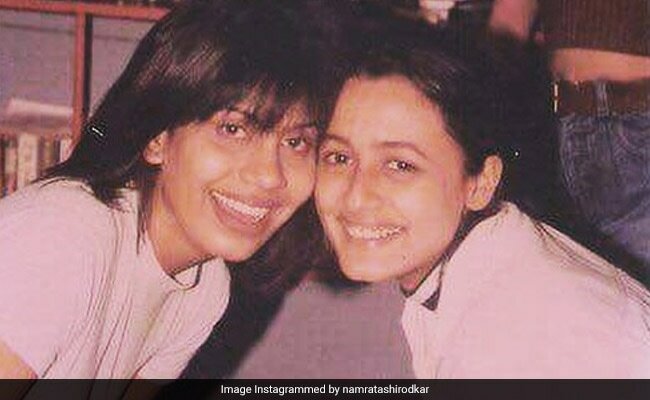 Actress Namrata Shirodkar replaced Monday blues with a throwback mood as she Instagrammed a delightful blast from the past. "Priceless moments...BFF... if time stood still," Namrata Shirodkar captioned her new post, in which she features with her best friend Svetlana Casper. In the photo, one can spot a much younger version of Namrata Shirodkar but nothing much has changed really. Namrata lights up Instagram with an ear-to-ear smile on her Instagram post and can be seen sporting a retro look - oversized white shirt and baggy pants. Namrata Shirodkar's sister actress Shilpa Shirodkar was one of the first ones to comment on the photo: "Such a sweet pic, Chin," she wrote. Meanwhile, Namrata Shirodkar's Instafam made some interesting observations and posted them in the comments section. For example, the wall behind Namrata Shirodkar in the photo is stacked with cassettes and CDs, which are bona-fide Nineties memorabilia: "Cassettes and CDs in the background....only 1980s, 90s kids know that feeling," said a user while another comment read: "Look at the audio cassette collection. Old days!" Some also got reminded of Namrata Shirodkar from 1999 film Vaastav. Namrata Shirodkar's throwback photo is a variation in the umpteen family photographs she shares on Instagram. Namrata Shirodkar is married to South superstar Mahesh Babu and the two are parents to son Gautham and daughter Sitara, both of who almost always feature in the actress' posts. Namrata Shirodkar is a former Miss India and has starred in films like Hero Hindustani, Astitva, Pukar and Bride And Prejudice.